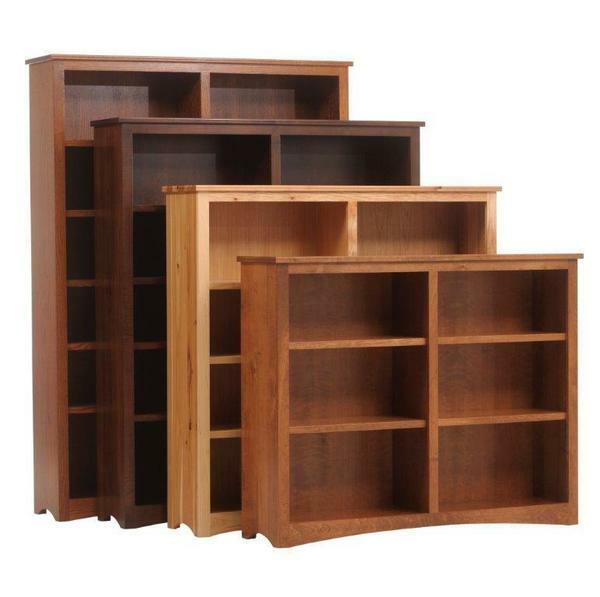 Available in a variety of different heights, plus a generous selection of wood & finish options, this Mission style bookcase is the perfect built-to-order bookcase for your home or office storage needs. Give one of our friendly Amish furniture consultants a call today for additional information on this Prairie Mission Style Bookcase. Call toll free at 866-272-6773. I placed my order with DutchCrafters in August for a 48” high Amish Prairie Mission Bookcase. I chose the rustic cherry wood, standard varnish, shiplap back, and knots filled with black epoxy. Savannah in customer service was most helpful with helping me with choosing options and stain color. She even sent me out samples. The lead time was approx 2-3 months. Savannah kept me posted along with Heather, as to the progress of my item. I chose the white glove delivery service and was glad I did. We received our bookcase yesterday. Very well packaged. Rob from the shipping company set our bookcase in the desired spot in our family room and unpacked and removed all packing materials. He even set up the shelves and put felt pads under the legs. There was not a scratch on the product, after traveling all the way from Ohio. We just love this bookcase. It is an heirloom. The rustic cherry was more clear than expected with very few knots. We were happy we chose the sold cherry shiplap back too. I have enclosed several picture of the bookcase below. We are looking forward to purchasing our next item from Dutchcrafters! Part of a complete home office/library suite purchased. Excellent quality of construction and finishing. Suitable for any home office, library, or family room.